There was a collective sigh of relief across financial markets after President Donald Trump hinted that he could extend the March 1 deadline for increasing tariffs on Chinese goods if the two sides get close to a deal. The positive mood felt across global equity markets following Trump’s comments continues to highlight how sentiment remains heavily influencedby US-China trade developments. While Asian, European and US shares are seen pushing higher amid the ‘risk-on’ mood, this positivity is likely to be shortlived. It is certainly too early for any celebrations, especially when considering how lessons of the past have repeatedly taught investors how unpredictable the Trump administration can be. If talks dragon after the deadline extension, global optimism will most likely fade as renewed trade uncertainty adds to the bucket load of geopolitical risks draining investor confidence. Sterling offered a fairly muted reaction this morning despite UK inflation dropping below the Bank of England’s 2% target in January for the first time in two years. Consumer prices fell to 1.8% last month thanks to cheaper energy prices. Subdued inflation in the UK is likely to lower the odds of the Bank of England raising UK interest rates anytime soon, which is inevitably negative for the British Pound. Sterling’s price action witnessed in recent weeks confirms how Brexit continues to overshadow economic fundamentals. With six weeks to go until Britain leaves the EU, the Poundis poised to remain highly sensitive and volatile as markets closely monitor Brexit developments. When looking into the technical picture, the GBPUSD remains under noticeable selling pressure on the daily charts. Sellers need to secure an intraday breakdown below 1.2850 to encourage a decline towards 1.2780. For bulls to jump back into the game, prices need to breakout and close above 1.2900. Will US inflation test the Fed’s data dependence? Across the Atlantic, investors will direct their attention towards the pending US core inflation report for January which is expected to print at roughly around 2.2%. The CPI readings will be closely watched because markets will use these announcements to gauge the Fed’s level of data dependence and whether the central bank's dovish tone is justified. Should inflation tick higher in the US, the central bank may be prompted to resume its ratehikes, which could translate to more gains for the Dollar. The ‘risk-on’ vibe sweeping across global markets and the stabilizing US Dollar are bad news for Gold which tends to shine in times of uncertainty. Appetite for the metal is likely to take a hit today as trade optimism sends investors to riskier assets. However, Gold has nothing to worry about in the longer term given the unfavourable market conditions and geopolitical risks bubbling in the background. With concerns over slowing global growth on the mind of many investors, Brexit drama, China slowdown fears and many other negative themes floating in the air, Gold bulls are safe. A primary driver that will heavily support the precious metal this year will be expectations over the Fed taking a break on US rate hikes. Focusing on the technical picture, Gold remains bullish on the daily charts as there have been consistently higher highs and higher lows. If $1,308 proves to be a reliable support level, then prices could challenge $1,320. 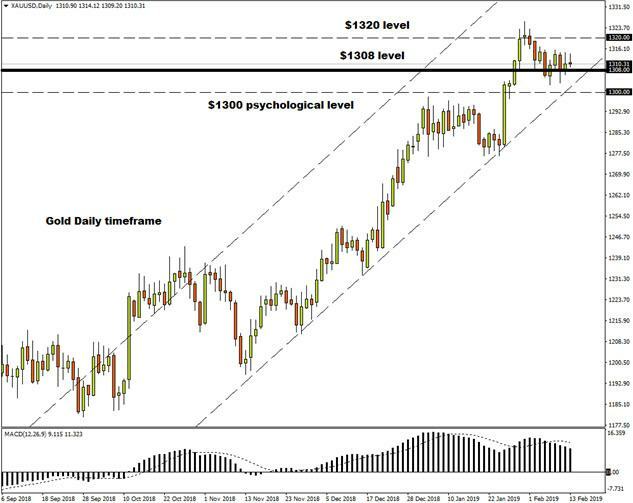 However, a breakdown below $1,300 will most likely open a clear path back towards the $1,300 psychological level. Disclaimer:This written/visual material is comprised of personal opinions and ideas. The content should not be construed as containing any type of investment advice and/or a solicitation for any transactions. It does not imply an obligation to purchase investment services, nor does it guarantee or predict future performance. FXTM, its affiliates, agents, directors, officers or employees do not guarantee the accuracy, validity, timeliness or completeness of any information or data made available and assume no liability for any loss arising from any investment based on the same.